1 hour road transfer (forest route) or 1.5 hour road transfer (river route) from Victoria Falls town. The best time to travel is largely dependent on what the visitor most wants to see and do. The dry months from May to October are generally for game viewing. There is on average very little rainfall and September to October is quite hot. The Victoria Falls is best viewed when its in full flood which normally occurs in April and May. 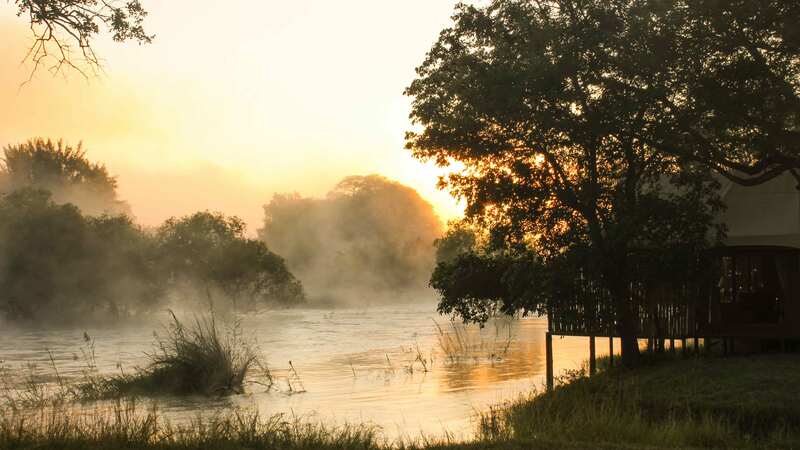 Zambezi Sands River Camp is nestled in an exclusive location on the banks of the mighty Zambezi River, one hour by road from Victoria Falls (45 minutes of which is a game drive in Zambezi National Park). 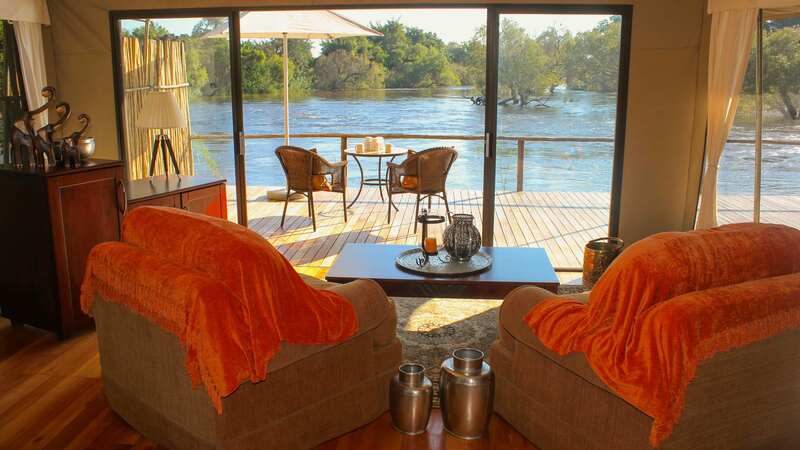 This tented lodge is situated within the western area of the Zambezi National Park, upstream of the Victoria Falls. Zambezi Sands is unique in that it features not only water based activities and some glorious wildlife and scenery, but is also close to the Victoria Falls with its’ myriad activities. Zambezi Sands River Camp is fully under canvas with raised wood decking linking the accommodation and the main hospitality area. At the Zambezi Sands River Camp, you will have the perfect opportunity to view wild game and take amazing pictures. 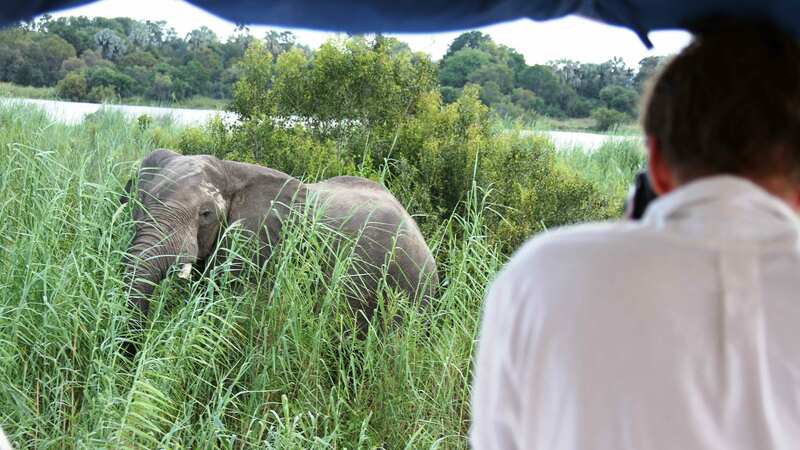 The game viewing is good with regular sightings of elephant, buffalo and lion. Zambezi Sands is ideal for clients who want to combine a mini safari with seeing the magnificent Victoria Falls. The tented camp has 8 Bedouin style luxury tents which are well spaced out along the banks of the river. Each tent has a lounge area, stocked mini-bar, en suite bathroom, outdoor shower, private splash pool and electricity run by diesel/solar generator. Each of them is equipped with mosquito nets, electronic safe, ceiling fans, hair dryer, robes and laundry facility. The main tented camp has a sitting/dining area and bar under canvas. This opens out onto multi-level wooden decks which make the most of its stunning setting right on the mighty river. All the meals are professionally prepared by the kitchen team. Protected from the main river channel by the serene Siansimba Islands, the many channels and islands in this part of the river are perfect for canoe and walking explorations. Game drives and walks are also possible in the the Park along with all the traditional Falls activities. Diverse possibilities of Game Activities.